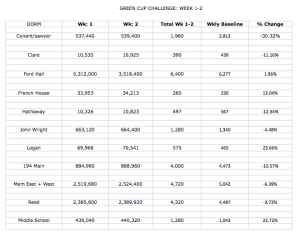 Green Cup Challenge: Week 1 Results! For the last two weeks Sustainable life has been keeping track of the amount of energy each dorm has been using, and our first week results are in! 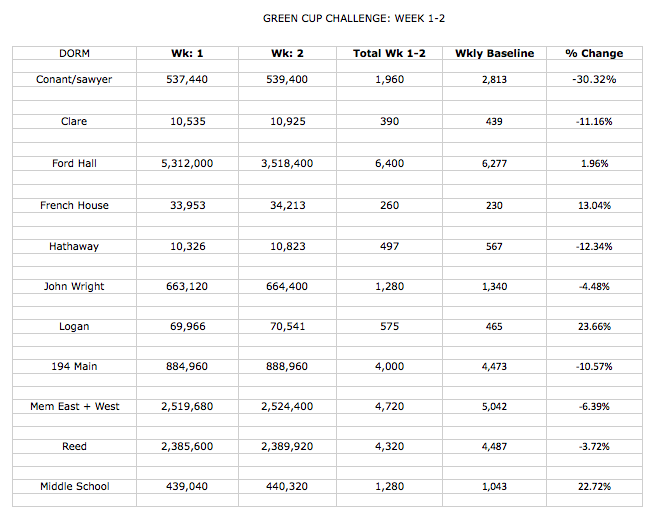 Green Cup Challenge at Williston is not only a national competition with other schools to reduce the most energy, but also a competition between each dorm. The winner who reduces the most amount of energy by February 12th, will get a pizza party! Chart of each dorm, its recordings, and the percent change from the average. 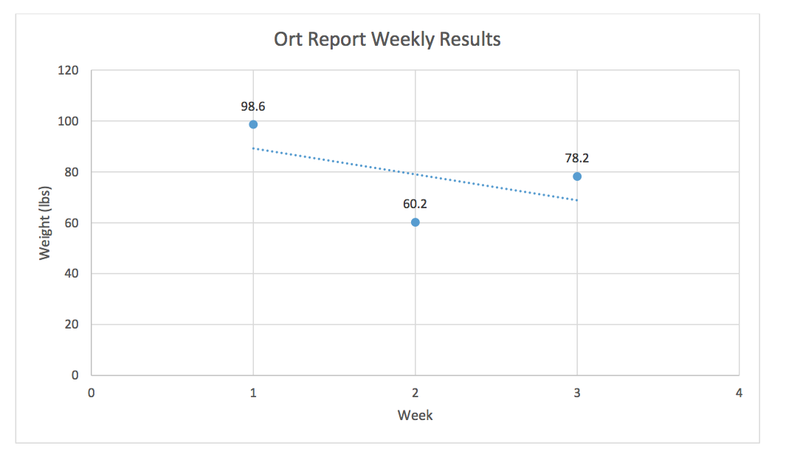 This week was the second week that the food waste for the Ort Report was recorded! 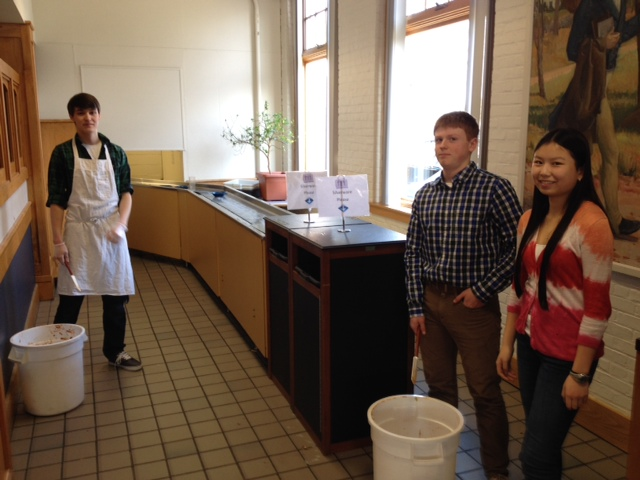 On Monday during lunch, diners produced 60.2 pounds! That is a great improvement from last week’s 98.6 pounds of waste! It seems like students and teachers are becoming more conscious of their impact of waste! 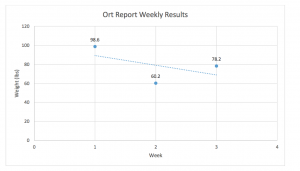 Although the 60.2 pounds is a commendable reduction from last week, please remember that the club is still tweaking the collection process of the Ort Report. This Monday, we collected food waste and liquid waste for only half of the lunch period; the other half we collected only food waste and forgot to collect liquid waste. The Ort Report is a process and glitches like this are inevitable, but hopefully next week we will be able to collect and measure the waste as accurately as possible! Green Cup Challenge and Ort Report Ahead! 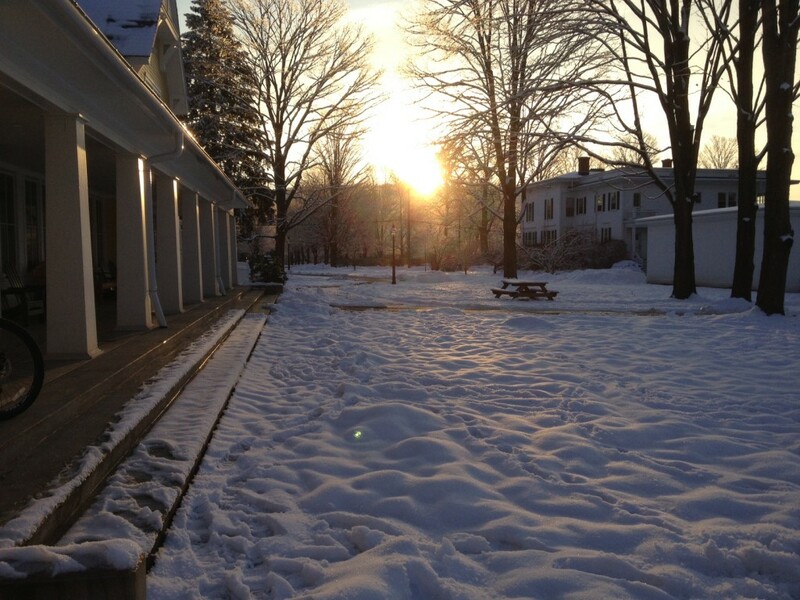 Have you thought recently about your impact on the environment?